Every year we have plants that have aphids on them. It's not always the same ones. Last year we had oodles of them on the Anthony Watererer Spireas, but we also had oodles of lady bug larvae to eat them up. This year we have them on our Joe Pye Weed. Oodles of them again and I only saw one ladybug so I kept watching to see what would happen. 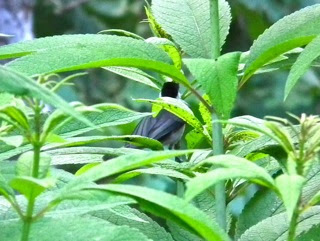 Was I surprised to find the Carolina Chickadees jumping all over the plants like they were in a salad bar of delicacies. I snapped a few photos but the leaves didn't make focusing easy, but you can see from the photo that there are aphids and that's a chickadee munching away. 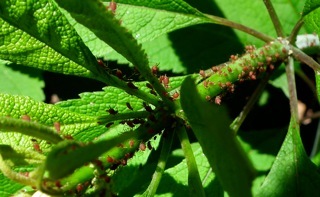 That took me to researching what else eats aphids since we don't use sprays and pesticides in our garden. We used to make up some simple home recipes but it's been years since we've bothered even doing that since it seems any problem presents itself with a solution if we watch and wait. Hummingbirds don't just drink nectar. They eat insects as well and enjoy aphids, ants, mosquitoes, gnats, midges, caterpillars, flying ants, weevils, small beetles, whiteflies and insect eggs. They eat small spiders. The female feeds her young with a mixture of nectar and tiny insects and spiders, that she collects in her crop and regurgitates into the mouths of the young. The insects provide the protein the babies need to grow. It was interesting to find out that Bald-faced Hornets and Yellow Jackets enjoy aphids since they are both meat-eating insects. We had another nest this year of Bald-faced Hornets in another location, but something got into it and destroyed it and obviously ate the contents. As a side note, natural predators of adult hornets include dragonflies, robber flies, hornets, centipedes, mantids and spiders. Some species of birds and frogs consume them. Nests are preyed upon by raccoons, foxes and striped skunk if they're close to the ground (this one was not). The mammals usually rip them open in the fall, when nests aren't as active. They eat adults, pupae, and larvae. Here's a list of birds and their insect preferences from Gardeners.com. It's sure a lot less work gardening to have the natural force of nature helping out. There's no words to describe the joy it brings us to watch all the species flying about and eliminating many of the tasks we used to do. Creating a backyard wildlife habitat is simple if you enjoy gardening. We have a front and backyard habitat and it's our favorite source of entertainment, besides not mentioning how rewarding it is to provide for God's creatures here on earth. Get more info on Creating a Backyard Wildlife Habitat. Just wanted to post that I truly enjoyed this post. My husband and I have become avid gardeners and also do not use any pesticides. We rarely use 'natural' remedies now either as we have found the same thing as you. Provide a habitat for your garden and both the animals/insects/birds as well as plants thrive. It is wonderful to sit in our backyard and see all the wildlife/nature going about it's business. Our young daughter especially loves watching the birds and recently got to watch a caterpillar transform into a butterfly. What a beautiful world God has created indeed! Thanks again for your post.